The Nintendo 3DS has been an absolute powerhouse for the JRPG genre. After a shaky launch, many years ago now, the console rapidly developed into a real home for the genre, with everything from major games from major publishers through to very niche, indie stuff. 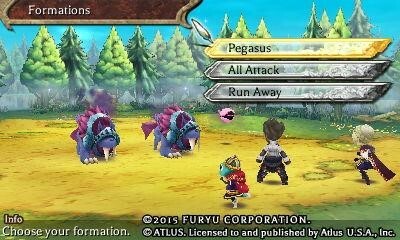 Why has the 3DS attracted so many great JRPG games? It's probably a mix of things, of course, but the console's popularity in Japan certainly helped, as did the fact that it's relatively inexpensive to develop for the 3DS (thanks to it not being remotely close to HD), and therefore it was a cost effective way to pull together games that can last dozens - if not hundreds - of hours. In honour of the genre, this week we're taking a look at our favourite JRPGs on the 3DS console. Of course, it's very likely that you have your own favourites that we haven't listed here, so be sure to let us know what those are in the comments! How do you make the already great Etrian Odyssey series even better? You put Risette in it. 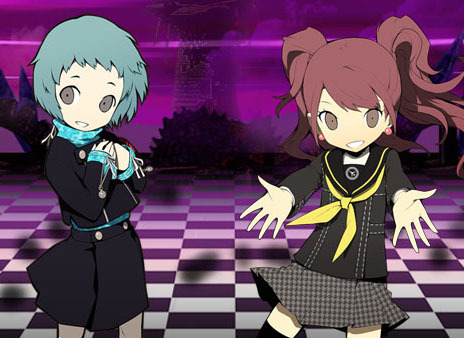 And the other Persona 3 and 4 characters, I guess, but mostly Risette. 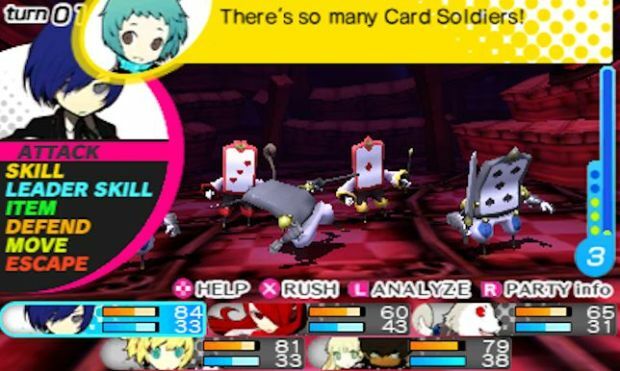 Seriously, though, Persona Q was a nice surprise when it came out of almost nowhere a while back. A Wizardry-style dungeon crawler, but with the personality, sense of style and aesthetics, and characters from Persona 3 and 4 thrown in for good measure. The mix worked better than I think anyone was expecting. In Japan, this was released in a package of four small (but not mini) games, but was broken up into individual titles and sold over the eShop in English. And it’s a real pity that Crimson Shroud came into life like that, because it’s brilliant and deserves to be a full game. 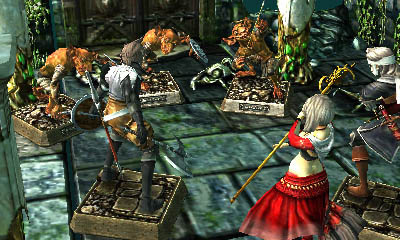 It plays out like a Dungeons & Dragons board game, where you move pieces around and roll dice to decide combat. On that there’s a visual novel-like story, telling you of your delve into the dungeon. For fans of tabletop games, this is utterly essential, unique, interesting stuff. It’s just a pity that it’s not a full-length game. 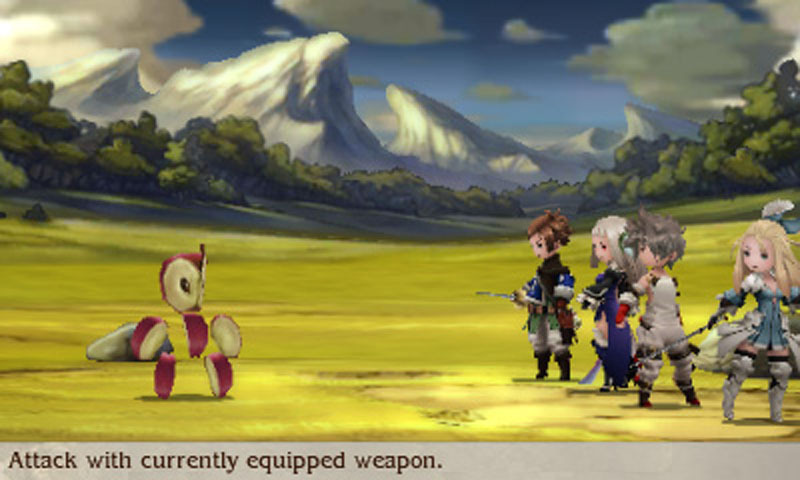 I thought Square Enix’s Bravely Default was as sublime as retro throwback JRPGs come. I was wrong. Bravely Second is even better. Beyond the exceptional gameplay mechanics and beautiful art is a game that is intensely funny, creative and artful. It’s impossible to come out the other end of this game and not love each of the characters, having carefully levelled them up over many dozens of hours of play. And Edea is still the most adorable kitten in any game, anywhere. Mrgrgrgr. It takes a lot of gumption to try and take on Pokemon. It takes genius to actually improve on the monster collecting formula. Yo-Kai Watch succeeded on both counts. The core loop remains the same as in Pokemon – you’ll run around, collecting monsters and then setting them to fight other critters. 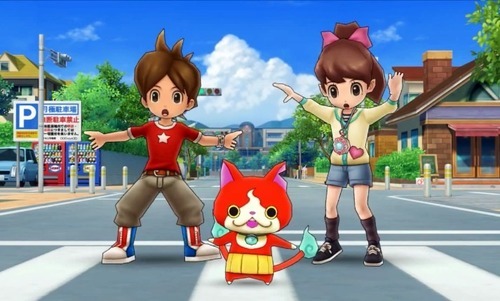 But in being set in a small town and having life outside of the Yo-Kai being so mundane, Yo-Kai Watch offers a powerful nostalgia for youthful play and adventure that is more relatable and much more charming than what we get in the relatively abstract Pokemon. Yo-Kai Watch has a wicked sense of humour, too. 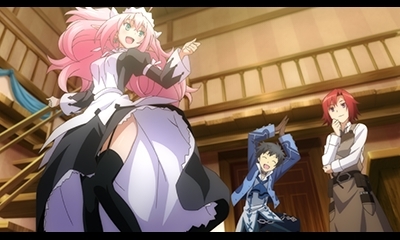 It wouldn’t be a list by me without one fanservice-heavy game, and Conception II is that game. 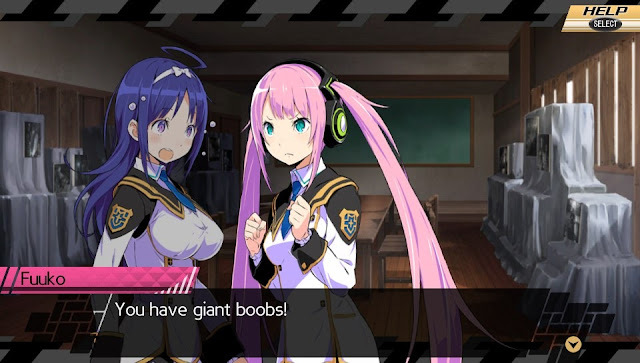 Ignoring the repetitive and lengthy random dungeons for a minute, Conception II is a clever deconstruction on the pressures that Japanese culture is trying to place on its youth to breed, and throws in a harem fantasy because it can. There are shades of Persona in Conception II, in that a lot of the time in the game is spent getting to know the various girls, developing bonds with them, and helping them through their personal issues. It’s not nearly as well written as Persona 4… but then this game has more girls and they spend more time in swimwear. Fair trade-off, really. Aside from the original Rune Factory on the Nintendo Wii, the series hasn’t appealed to me as much is should, with me being a Harvest Moon tragic and all. 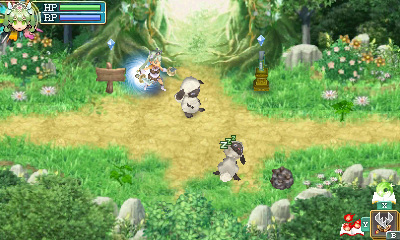 The odd monster designs (when I just want sheep and cows to breed) were part of the issue, but I simply never found the combat to be very interesting. But that changed with Rune Factory 4, and I’m not even entirely sure why. It’s much the same game as its predecessors, but perhaps it was just so refined and carefully designed this time around that it was the realisation of the developer’s goals all along. Though technically not part of the Luminous Arc franchise of tactics RPGs (for licensing reasons), Stella Glow is very much a Luminous Arc tactics RPG. What does this mean? Well, it’s a fairly traditional example of the genre, which is enhanced through extensive characterisation and, well, extreme anime tropes. You’ll spend a lot of time getting to know the other characters in your team in this game. 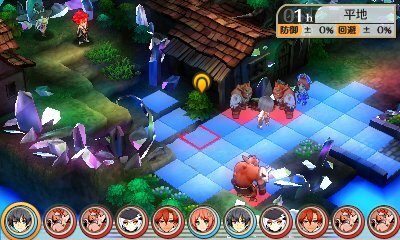 The combat system itself is tight and well designed, and there are simply not enough tactics RPGs on the 3DS, so when one like Stella Glow comes along, it’s essential stuff. This is the most unique JRPG that I have played in a very long time. In Lord of Magna, to attack the enemies, you use the 3DS’ touch screen to pull your hero back, like an elastic band, and then “flick” the hero into a horde of enemies. Like ten-pin bowling, if those enemies bump into other enemies, the damage inflicted has a cascading effect. Layered over the top of this is one of the sweetest and most innocent harem stories we’ve seen in a Japanese RPG to date. With only the lightest touch of fanservice, this game is a story of friendship, community, and the simple life. And that’s appealing stuff. From one of the more innovative JRPGs to one of the most resolutely traditional, The Legend of Legacy is an artful little game that almost does away with storytelling entirely. Instead, like with the really old Final Fantasy or Dragon Quest games, this one uses a couple of sentences to point you in the first direction, and then lets you get on with the grind and discovery. It’s not a game for everyone as a result, but between the nostalgia rush, and the fact it does its combat and discovery elements so darned well, The Legend of Legacy is a deservedly essential game for any of us that actually grew up with the JRPG genre. I write this having only just started Fates, and on my very early first impressions Awakening will be replaced by Fates quickly enough, but for now, Awakening is on my list, because it is Fire Emblem, and I love Fire Emblem. What I love about Fire Emblem is the stories and characters, and Awakening delivers both in spades. It’s very easy to come to care for each of the characters in the game, as they’re all given enough screen time to develop real personality. 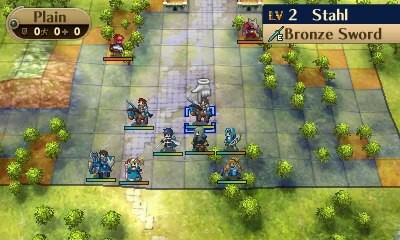 The over-arching plot is suitably epic, too, and the map design is classic Fire Emblem stuff. These are the kinds of games you can get lost within for weeks, and that’s exactly what I did with Awakening.